Today's guest blog post is from Teresa Lorensen of Rural Route Rust and Bloom Where You’re Planted Farm of Avoca, Nebraska. This is the first in a series of blog posts where Teresa will give us a behind-the-scenes look into the different seasons of their businesses on the farm. Welcome, Teresa! Writing a blog post for Rural Revival was on my to-do list this week but I couldn’t figure out how to get started. Then I saw this quote on their Facebook page, “Remember Why You Started.” Wow. That’s great advice for anyone pursuing a dream and provided the perfect starting point for this post about how I’m living mine. So...hi! I’m Teresa and I, along with my husband of 20 years, Terry, operate a two-part business on our farm outside of Avoca, Nebraska. Early in our marriage we were living in the small town of Elmwood, Nebraska, in a little ranch house on a corner lot. We had flower gardens and a couple of cats but dreamed of living on a farm. Both of us are country kids and accustomed to more space and fewer neighbors than we had in town. So in 2002, when the opportunity came along for us to move to my Grandma Brandt's farm (just over the hill from where I was raised and where my parents still live), we jumped at the chance. My grandparents moved here in 1944, raising livestock, crops, and two daughters on the farm. Back in 2002, Grandma was living with my mom and dad (my Grandpa died before I was born). She was excited we were going to live here and I would often go eat lunch with her during renovations and tell her what we were working on. After seven months of DIY remodeling, mostly on nights and weekends, we moved in. The do-it-yourself thing worked for us because Terry was a self-employed builder/remodeler in those days. My occupation was as director of a small museum. Like any old farm we had a lot of outbuildings in various states of disrepair. The late-1800s barn needed attention if it was going to survive. In order to warrant that kind of investment it needed to have a purpose, so we hatched an idea to open the farm to the public as a pumpkin patch and educational farm. The barn would house a gift shop and pumpkins for sale. My dream of owning a business was finally coming true! “Bloom Where You’re Planted Farm” was named for advice from my mom; in a nutshell, make the most of the place you are at in life. We opened on October 1, 2005 and hosted approximately 500 visitors over five weekends. Every year we added something new or fixed up another building, taking it slowly and reinvesting profits into the improvements. Today we offer a full slate of pumpkin patch activities, hay rides, a U-pick patch, play areas, nature trails, shopping (more on that in a bit) and food served in a restored one-room schoolhouse. We grow a wide variety of fall produce including Jack-O-Lantern and heirloom pumpkins, squash, gourds, and hay. We still have our first cow Molly who we bottle fed and whose descendants now make a herd of 16. Add in four horses, three goats, a dog, three cats, and the occasional chicken, and we have plenty of mouths to feed. The fall business continued to be our side hustle for years while we kept working our “real” jobs. Then in 2013 we took another leap and started the Rural Route Rust Vintage + Handmade Market. From day one our fall-season store offered antiques and vintage items for sale. We would visit auctions and garage sales hunting for merchandise to complement our inventory of gifts, crafts, and seasonal décor. We loved it and began to notice this “junk” revolution happening – people were going crazy for anything old, fun, and funky that they could repurpose in their home or garden. It didn’t have to be a fine antique – if it was useful, unusual, or had a story, it was in demand. We saw an opportunity to bring visitors to the farm outside of just the fall season and began buying a lot more old stuff with plans to have a big sale that spring. To make it more of an occasion (and give more incentive for shoppers to come to the farm) we invited 13 or 14 local vendors of antiques, vintage, and handmade goods to join us, and opened our schoolhouse café for lunch. We had an encouraging turnout, pretty good sales, and a LOT of fun. We caught a bad case of “junk” fever and wanted to continue building that side of the business. We began traveling to shows, mostly local, but we did our first out-of-state show in Des Moines, Iowa that November. Terry has gradually phased out his home remodeling business and I gave up my museum job in 2016. The farm/pumpkin patch and Rural Route Rust (both hosting the market and vending at other shows – in 2017 we sold at 11 shows in 7 states) has been generating enough income to allow us to work entirely for ourselves! It has been a fun and ever-evolving experience, introducing us to amazing friends and taking us to all kinds of new places. We have learned so much and are endlessly inspired by other vendors’ talent for display, merchandising, and marketing. All of the vendors at our show are small businesspeople, many of them rural, and helping them succeed is a favorite perk of hosting the Rural Route Rust market. 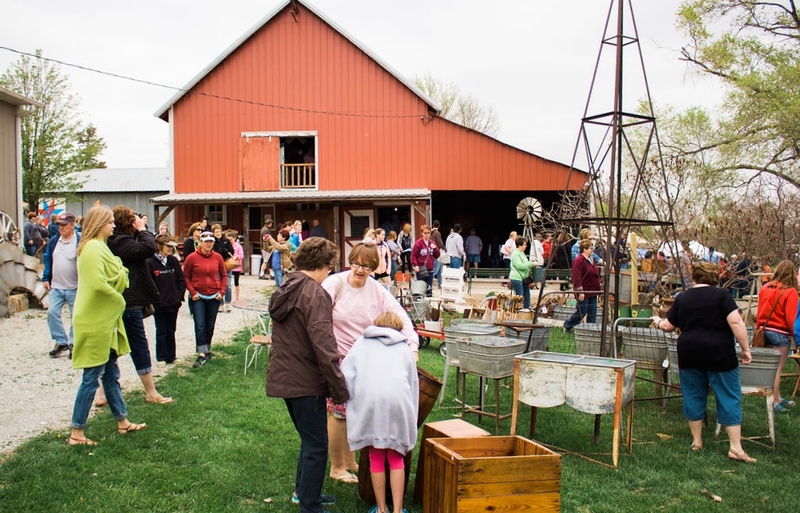 Our 6th annual Rural Route Rust Vintage + Handmade Market is coming up on May 5. Here’s a little of what that looks like as the big day gets closer. Promoting the event is always on my mind. I want to do the best job possible to get people here to buy from our vendors and make it a great show for them. That is priority #1! I use the term RELENTLESS PURSUIT when it comes to getting the word out about Rural Route Rust. There are many more vintage markets competing for shoppers’ time and dollars now than there were five years ago. Attracting enough people who are motivated to spend their hard-earned money is a 24/7 job. Some avenues we use for advertising are Facebook (promoted posts, vendor previews, giveaways, etc. ), Instagram, online calendars, an email newsletter, press releases, and some print advertising. We also hand out about 2000 postcards and give them to our vendors to distribute. We continue to hunt, pick, and gather "new" stuff to sell, but have also been focusing on fixing up project pieces we’ve accumulated. Moving the market to May (for the first time) instead of early April has really helped there. We've been firing up the heaters in the garage (it is refusing to warm up much around here!) and setting to work sanding, painting, repairing, and finishing projects of all sizes. Some are fun, some are a real pain, but finishing them and moving them to the "ready to be sold" area feels fantastic! The barn and storage areas are getting full! We use the barn, schoolhouse, and lawn area for our merchandise and that will all be set up in the last 10 days before the show. Other tasks include communicating with vendors, marking out spots, getting electrical hookups in place for the food trucks and tents, setting up photo op areas, roping off the parking area, communicating with employees, getting signs ready, and about a hundred other things. And did I mention we are heading to Minnesota next week for a show?? Time management and to-do lists are crucial in the weeks leading up to Rural Route Rust and I’d better get back to work!